We wholeheartedly agree with the report’s conclusion that “We do not know the extent to which environmental contaminants contribute to the cancer burden, but we know enough to act.” Prevent Cancer Now wanted to find out what Canadian cancer and health organizations are doing in this regard, so we polled a number of leading cancer and health organizations. We received responses from the Canadian Cancer Society (CCS), the Canadian Association of Physicians for the Environment (CAPE), the Canadian Public Health Association (CPHA) and the Canadian Partnership Against Cancer (CPAC). Here is a summary of their responses. 1. Given the findings of the report, what is your organization doing to eliminate environmental carcinogens in our workplaces, schools and homes, at their source? All four organizations expressed their view that Canadians should not be exposed to cancer-causing substances. They identified the work they are doing to eliminate, substitute or reduce use of substances known or believed to cause cancer. CCS cited its work on smoking bans to reduce exposures to second-hand smoke, bans on the cosmetic use of pesticides, and its position against the continued mining and export of asbestos. CAPE is actively campaigning for a Canada-wide prohibition on lawn pesticides; a ban on the mining and export of asbestos; and a speedy phase-out of Ontario’s coal-burning electricity plants. CPAC has prepared and disseminated five environmental scans and meeting reports addressing toxic use reduction and environmental and occupational exposures, posted on the primary prevention resource section of its website. Another useful resource is its Prevention Policy Directory, housing Canadian policies and legal instruments (legislation, regulations, codes) issued between 1997 and 2007 that address the key modifiable risk factors for cancer and related chronic diseases. CPAC is planning a series of three webinars to promote use of the directory early next year. CPHA began policy and advocacy work regarding environmental health over 40 years ago. Its initial advocacy work, in 1970, called for the immediate control of the sale and use of persistent pesticides such as DDT, BHC, dieldrin, aldrin, and endrin. As long ago as 1972, the organization called for ongoing monitoring and assessment of the influence of environmental pollutants on health and the need for environmental quality guidelines, limits, or standards to protect human health, among other measures. This same call is made in the President’s Cancer Panel report, 38 years later. In 1973, CPHA emphasized that human health and the environment we live in are inseparable. Since then, CPHA has passed another dozen resolutions that support environmental health and promote use of the precautionary principle. CPHA has lobbied for the inclusion of this principle in sound environmental health practices and feels it should be mandatory in policy development at all levels of government. In the 1990s CPHA made environmental health its top priority, issuing Human & Ecosystem Health: Canadian Perspectives, Canadian Action in 1992, as the basis for further work in the area of human and ecosystem health. A 1998 report documented Reasons for children being more vulnerable than adults to environmental contaminants in a special supplement to the Canadian Journal of Public Health. CPHA called upon the federal Minister of Health to develop a policy on children’s environmental health and establish an office of Child Health Protection to support research on children’s environmental health. CPHA also asked the Minister of the Environment to ensure that the implementation of the Canadian Environmental Protection Act provided appropriate protection to children. Several of the groups polled noted their investment in research to better understand who is being exposed to carcinogens in our environment to help focus exposure reduction strategies and cancer prevention programs. CCS noted that it has partnered with other stakeholders to launch the Occupational Cancer Research Centre in Ontario. CPAC cited its CAREX initiative, a resource for developing estimates of the number of Canadians exposed to known, probable and possible carcinogens in workplace and community environments. CAREX Canada aims to identify regional differences and vulnerable populations. 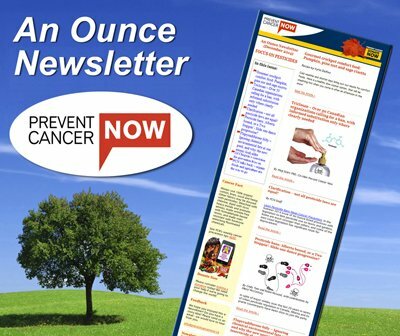 The Canadian Partnership for Tomorrow Project, a population health study looking into the causes of cancer, is highlighted elsewhere in this issue. 2. What is your organization doing to raise awareness of steps individuals can take to protect themselves and their families? CCS says they support a community’s right to know what they are being exposed to and how, and disseminates such information to the public. They believe that all consumer products, such as cleaning products and personal care products, should be labelled with a list of ingredients and clear, easy to understand warning labels or symbols on products containing cancer casing substances so people can make informed choices about the products that they are buying and using. CCS notes its particular concern about exposures to children, with a focus on second-hand smoke, UV radiation indoor tanning and the cosmetic use of pesticides. In addition to distributing information on how individuals can avoid carcinogens, CAPE believes individuals can best protect themselves by working for the elimination of carcinogens. They actively encourage citizens and health professionals to contact elected officials with the message that cancer-causing chemicals are unacceptable and must be phased-out. CPAC and CPHA work primarily through their partners and members, some of whom provide information to the public and policy-makers. Both organizations provide access to research and policy reports and public education materials that may be used by their membership. 3. What key steps do you recommend be taken by our federal and provincial governments to eliminate environmental carcinogens at their source? Support and advocacy for the precautionary principle where appropriate. Advocate for the introduction of new laws that aim to eliminate, substitute or reduce the use of, not just the emissions of, toxic substances. Work with government to raise awareness about the dangers of radon and implement public policies to better protect Canadians from radon exposure. Work on both the Canadian Environmental Protection Act and the Chemicals Management Plan so that chemicals of concern are identified and acted upon. Worked at the provincial level on toxics use reduction legislation. Among its current activities, CAPE urges the Federal government to ban lawn pesticides across Canada. They are calling upon the Alberta government to enact a moratorium on tar sands development, and the Ontario government to shut its coal plants by the end of 2010. Quebec is being urged to enact an immediate ban on asbestos mining and export. CPAC did not provide recommended actions for our governments, but rather noted that it serves as a broker of cancer control knowledge to help inform governments, NGOs and other key stakeholders, leaving it to them to advocate for change. 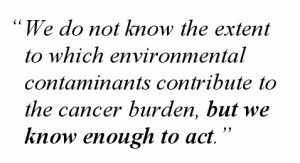 CPAC did note that it will circulate the President’s Cancer 2009-2009 Report on Environmental Cancer Risk to its Primary Prevention Advisory Group. CPHA notes that its stance on environmental health is very much in line with the President’s Cancer Panel report. Its environmental resolutions, motions and policy statements outline the need for actions at all levels of government to protect the health of Canadians from environmental toxic pollutants. Like the Cancer Panel, CPHA emphasizes the need for a comprehensive and coordinated approach, which includes research, policy, programs, monitoring and rigorous controls, to minimize the influence of environmental factors on health. Adopting a precautionary approach towards the protection of the environment is also seen as a fundamental measure in pollution prevention and the management of toxic substances. CPHA urges federal and provincial governments to focus on ecosystem health, as it is intrinsic to human health and to the prevention of cancer. If we all agree, why isn’t more being done? As we reviewed the information provided by these key organizations on their work to eliminate carcinogens from our environment, we were heartened, but confused. If there is such consensus on the link between environmental carcinogens and cancer, why is more not being done? Why do we continue to have to lobby the Quebec and Federal governments to end their support for the mining and export of asbestos? Why do we have to fight for hormone disruptors, such as BPA, to be removed from food and drink containers? Why do most provinces in Canada not yet have legislation to ban the cosmetic use of pesticides? Why does our government continue to subsidize the oil industry – especially the excessively polluting oil sands – rather than support renewable energy? Why does Canada not have a ‘Green Chemistry’ plan? Why does our government subsidize the current fossil-fuel intensive agricultural system, and not provide subsidies to sustainable, organic farming? Why is incineration supported by municipalities, and Zero Waste not promoted as the only long-term solution to our garbage problems? We look forward to the support of the organizations who responded to our survey, and to you, our members, as we continue to work to address these issues.